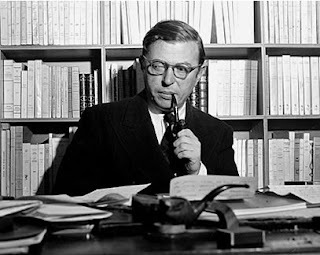 Considering that I'm studying Camus as part of my university course, it's only natural that the same course would cover a close associate of his, Jean-Paul Sartre. I've been meaning to read some of his work for a while now, kind of as a comparison to Camus. I'm not sure what to make of it. Dirty Hands covers a similar subject matter to Camus' The Just Assassins. The play starts with a revolutionary, Hugo, returning to a safehouse after spending two years in prison for an assassination. There he meets a former colleague, who decides to listen to his story to find out his motives for killing who he did; was it for political reasons or was it a crime of passion? It then flashes back to the time building up to the assassination. I have one major problem with this play: the main character. I could not stand him. The main conflict of his motive for killing sounds interesting, right? Except that it doesn't really add up either way. In terms of politics, he is utterly despicable: he states that so long as power is seized for the working classes, it doesn't matter that people have to die, caring more about the ideals than the people behind them; that could be an interesting character to follow, except that he doesn't have the courage to actually back up those ideas, meaning that he just sounds like a whiny brat. So he wants the world to burn for his ideals because he was never loved by anyone? Boo hoo, go cry in a corner while the more interesting characters, or at least the characters with any kind of agency can do something instead. If you think of it as a crime of passion, then that doesn't make much sense either because the only people he seems to care about are himself and maybe the guy that he kills. It's just frustrating, as the ideas behind it, like the tactics of revolutionary groups during war and the question of whether it is to a political party's best interest to be installed by a foreign power, were almost completely eclipsed by my utter loathing for the main character. If the play was meant to make me think about assassination and whether it can be justified or not, then it failed because all I was doing was hoping and praying that someone would finally kill this idiot.